Our volcano was Mount Fuji. Mount Fuji is a composite volcano so for our lava flow and pyroclastic flow we used orange and black lava. 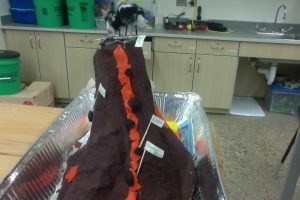 We also used black cotton balls for ash, and we used a pop bottle with orange water for our magma chamber. Overall, our group got it done on time and it looked just like we wanted it to look like.